We’ve got you covered! 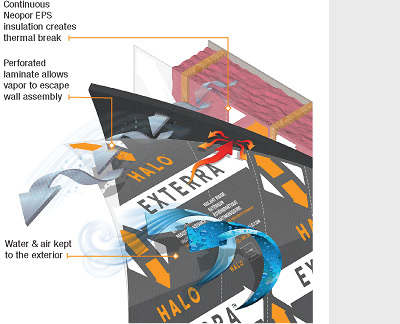 Halo Exterra is exterior breathable & mold-resistant advanced insulating sheathing. Specifically designed for exterior above-grade walls. Zero thermal drift & zero compromise. and allows moisture to leave the wall cavity. act as the exterior air and weather barriers. Zero thermal drift & zero compromise. For performance that Scores a 10/10. is often significantly less expensive than comparable XPS insulation products. 5. Halo can also minimize energy loss due to thermal bridging. 7. Light yet durable – perfect for today’s demanding job site. 8. The Neopor core is GreenguardTM Certified for superior indoor air quality. 9. Neopor is 100% recyclable and ozone layer friendly (does not contain any CFCs or HCFCs). engineered and laminated for its unique above-grade, exterior application. Halo is powered by Neopor, the new standard in thermal insulation developed by BASF. Thanks to millions of graphite infrared absorbers and heat reflectors that reduce thermal conductivity, Neopor provides the highest R-value in the world of EPS rigid insulation. 1. Custom thicknesses and compressive strengths are available upon request. Please contact Fastform Insulated Concrete Forms. exceeds most XPS guaranteed R-Values (contact Fastform to check the guaranteed R-value).